42.195 km in the most beautiful city in the world. This is a unique opportunity, take the opportunity to look up and enjoy this breathtaking scenery, the many monuments, these historical places. Schneider Electric Paris Marathon is a unique opportunity to capture the city, participating in one of the most noted races on the mythical distance of 42.195 km. Schneider Electric Paris Marathon is now one of the largest marathons in the world, characterized by the importance of his platoon as by the performance achieved. Each finisher creates certainly a memorable one. Nearly 145 nationalities and 57 000 runners come and confront the 42.195 km of the most legendary event that offers athletics. In April, the crossing of Paris, part of the Champs Elysées to Avenue Foch via the Bois de Vincennes and Boulogne, offers incomparable scenery peppered with all popular animations each other. The "Running the Show," Porte de Versailles, the above 3-day Marathon, has also become a meeting place linking more than 80 000 visitors with more than 200 professionals running. 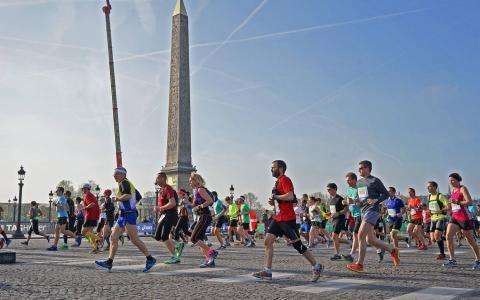 The personal challenge is combined with an excursion in the city leading athletes to beat the tar out of the arteries and the most prestigious squares of the capital at the foot of the Arc de Triomphe, the participants will start down the Champs- Elysées towards Concorde. Rue de Rivoli the then lead to the Place de la Bastille, and after a stay "green" in the Bois de Vincennes, the difficulty of the return trip will be softened by the outlook on the Notre Dame Cathedral and the Eiffel Tower . Each year, this sequence is attracting more and more tourists athletes: they are about 23 000 foreigners, or about 40% of the faithful pack the appointment. Like them, join us on the Schneider Electric Paris Marathon. The course, almost flat, form an almost complete loop (1 km between the places of departure and arrival). Starting downhill top of the Champs-Elysees. We leave eastwards to the Bastille and the Porte de Vincennes via the Place de la Nation. Then Soult Boulevard to Golden Gate. A loop in the Vincennes woods with a slight false flat in the 16th km and returned to Paris by the Porte de Charenton. Back in the rue de Charenton, the Daumesnil and the Place de la Bastille, to reach the banks of the Seine at the end of the Boulevard Henri IV (several underground). We enter the Bois de Boulogne by the Porte d'Auteuil for a new tree loop. Arrival Avenue Foch.